The Goldilocks of pillows, Green Cotton pillows are a medium-firmness that’s just right, and are wonderfully breathable in warm climates. 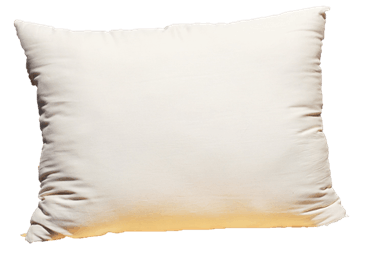 Encased in soft and smooth organic Sateen Cotton, these pillows can be fluffed, refilled, and reused for years to come. Available in sizes from travel to body pillows, White Lotus Home carries a Green Cotton pillow for everyone. Not sure how firm you like your pillows? Get your pillow with a zippered case, and add and remove filling to suit your own preferences. Simply store any excess material in a moisture and pest-proof container, or order more Green Cotton from our Wholesale Fibers section. We bought a green cotton body pillow jr for our daughter, who absolutely adores it and snuggles with it every night. One night when she was on a sleepover, I borrowed it for myself and oh my gosh - heaven! I actually just ordered my own, and looking so forward to getting it! (I'm 5'2" so I can still use the jr but I think if you're much taller you'll want the adult size.) Love! This pillow is great! Totally worth the money. These will last a lifetime!! I ordered super firm and medium. The firm is very firm but good if you like that! They are of the utmost quality! My guests love them too! I use it every day. Quality wise its very good.